bdata = bindata(sc) binned predictor variables returned as a table. This is a table of the same size as the data input, but only the predictors specified in the creditscorecard object's PredictorVars property are binned and the remaining ones are unchanged. bdata = bindata(sc,data) returns a table of binned predictor variables. bindata returns a table of the same size as the creditscorecard data, but only the predictors specified in the creditscorecard object's PredictorVars property are binned and the remaining ones are unchanged. bdata = bindata(sc,Name,Value) binned predictor variables returned as a table using optional name-value pair arguments. This is a table of the same size as the data input, but only the predictors specified in the creditscorecard object's PredictorVars property are binned and the remaining ones are unchanged. This example shows how to use the bindata function to simply bin or discretize data. Bin number (where the 'OutputType' name-value pair argument is set to 'BinNumber'); this is the default option, and in this case, 41 is mapped to bin 2. Categorical (where the 'OutputType' name-value pair argument is set to 'Categorical'); in this case, 41 is mapped to the '31 to 50' bin. WOE value (where the 'OutputType' name-value pair argument is set to 'WOE'); in this case, 41 is mapped to the WOE value of bin number 2. Create a creditscorecard object using the CreditCardData.mat file to load the data (using a dataset from Refaat 2011). Use the 'IDVar' argument to indicate that 'CustID' contains ID information and should not be included as a predictor variable. Show the bin information for 'CustAge'. These are the first 10 age values in the original data, used to create the creditscorecard object. Bin scorecard data into bin numbers (default behavior). According to the bin information, the first age should be mapped into the fourth bin, the second age into the fifth bin, etc. These are the first 10 binned ages, in bin-number format. Bin the scorecard data and show their bin labels. To do this, set the bindata name-value pair argument for 'OutputType' to 'Categorical'. These are the first 10 binned ages, in categorical format. Convert the scorecard data to WOE values. To do this, set the bindata name-value pair argument for 'OutputType' to 'WOE'. These are the first 10 binned ages, in WOE format. 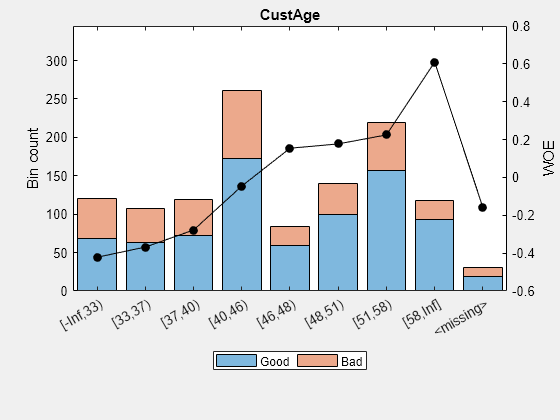 The ages are mapped to the WOE values that are internally displayed using the bininfo function. This example shows how to use the bindata function's optional input for the data to bin. If not provided, bindata bins the creditscorecard training data. However, if a different dataset needs to be binned, for example, some "test" data, this can be passed into bindata as an optional input. For the purpose of illustration, take a few rows from the original data as "test" data and display the first 10 age values in the test data. Convert the test data to WOE values. To do this, set the bindata name-value pair argument for 'OutputType' to 'WOE', passing the test data (tdata) as an optional input. These are the first 10 binned ages, in WOE format. The ages are mapped to the WOE values displayed internally by bininfo. Create a creditscorecard object using the CreditCardData.mat file to load the data with missing values. 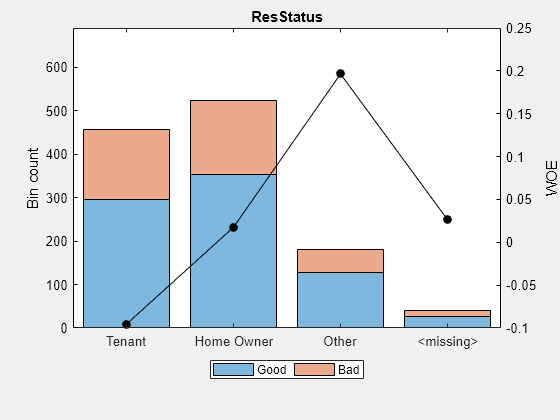 The variables CustAge and ResStatus have missing values. For the purpose of illustration, take a few rows from the original data as test data and introduce some missing data. Convert the test data to WOE values. To do this, set the bindata name-value pair argument for 'OutputType' to 'WOE', passing the test data tdata as an optional input. For the 'CustAge' and 'ResStatus' predictors, because there is missing data in the training data, the missing values in the test data get mapped to the WOE value estimated for the <missing> bin. Therefore, a missing value for 'CustAge' is replaced with -0.15787, and a missing value for 'ResStatus' is replaced with 0.026469. For 'TmAtAddress' and 'EmpStatus', the training data has no missing values, therefore there is no bin for missing data, and there is no way to estimate a WOE value for missing data. Therefore, for these predictors, the WOE transformation leaves missing values as missing (that is, sets a WOE value of NaN). These rules apply when 'OutputType' is set to 'WOE' or 'WOEModelInput'. 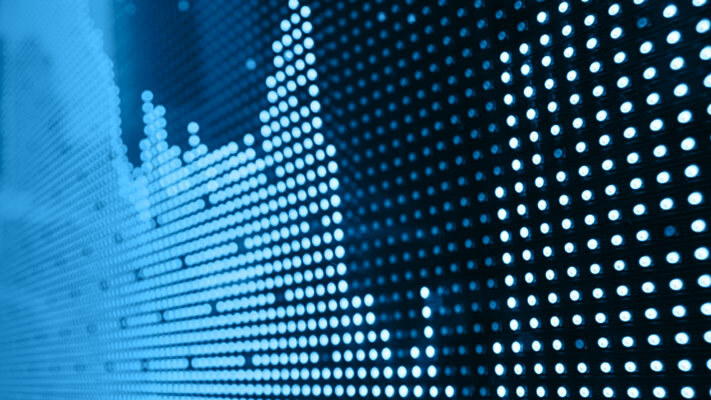 The rationale is that if a data-based WOE value exists for missing data, it should be used for the WOE transformation and for subsequent steps (for example, fitting a logistic model or scoring). On the other hand, when 'OutputType' is set to 'BinNumber' or 'Categorical', bindata leaves missing values as missing, since this allows you to subsequently treat the missing data as you see fit. When the 'OutputType' name-value argument is set to 'WOE', bindata simply applies the WOE transformation to all predictors and keeps the rest of the variables in the original data in place and unchanged. Applies WOE transformation to all predictors. Returns predictor variables, but no IDVar or unused variables are included in the output. Includes the mapped response variable as the last column. The fitmodel function calls bindata internally using the 'WOEModelInput' option to fit the logistic regression model for the creditscorecard model. Convert the test data to WOE values. To do this, set the bindata name-value pair argument for 'OutputType' to 'WOE'. The size of the original data and the size of bdata output are the same because bindata leaves unused variables (such as 'IDVar') unchanged and in place. The response values are the same in the original data and in the binned data because, by default, bindata does not modify response values. When fitting a logistic regression model with WOE data, set the 'OutputType' name-value pair argument to 'WOEModelInput'. The binned predictor data is the same as when the 'OutputType' name-value pair argument is set to 'WOE'. However, the size of the original data and the size of bdata output are different. This is because bindata removes unused variables (such as 'IDVar'). The response values are also modified in this case and are mapped so that "Good" is 1 and "Bad" is 0. Data to bin given the rules set in the creditscorecard object, specified using a table. By default, data is set to the creditscorecard object's raw data. Before creating a creditscorecard object, perform a data preparation task to have an appropriately structured data as input to a creditscorecard object. BinNumber — Returns the bin numbers corresponding to each observation. Categorical — Returns the bin label corresponding to each observation. WOE — Returns the Weight of Evidence (WOE) corresponding to each observation. Returns the Weight of Evidence (WOE) corresponding to each observation. Discards any predictors whose bins have Inf or NaN WOE values. When the bindata name-value pair argument 'OutputType' is set to 'WOEModelInput', the bdata output only contains the columns corresponding to predictors whose bins do not have Inf or NaN Weight of Evidence (WOE) values, and bdata includes the mapped response as the last column. Missing data (if any) are included in the bdata output as missing data as well, and do not influence the rules to discard predictors when 'OutputType' is set to 'WOEModelInput'. RawData — The response variable is copied unchanged into the bdata output. Mapped — The response values are modified (if necessary) so that "Good" is mapped to 1, and "Bad" is mapped to 0. Binned predictor variables, returned as a table. This is a table of the same size (see exception in the following Note) as the data input, but only the predictors specified in the creditscorecard object's PredictorVars property are binned and the remaining ones are unchanged.